At the end of our 10-day stay in London, England we thought we should do the ultimate touristy thing and see the changing of the guard at Buckingham Palace. We showed up what we thought was early and found a large crowd already in place. We found a decent spot on top of the raised Victoria Memorial structure in the center of the roundabout outside Buckingham Palace and waited for the show to start. I was snapping a couple of photos of the area when someone in the crowd screamed, “It’s the royals!” I immediately turned slightly to my left and saw a police escorted vehicle whizzing by flying the queen’s flag and with the undeniable Queen’s hat in the window. I got just one decent shot before the car turned the corner. Right after that we looked up and saw the flags on top of Buckingham Palace being lowered and then raised minus the Queen’s flag. Yes, the Queen has left the building! 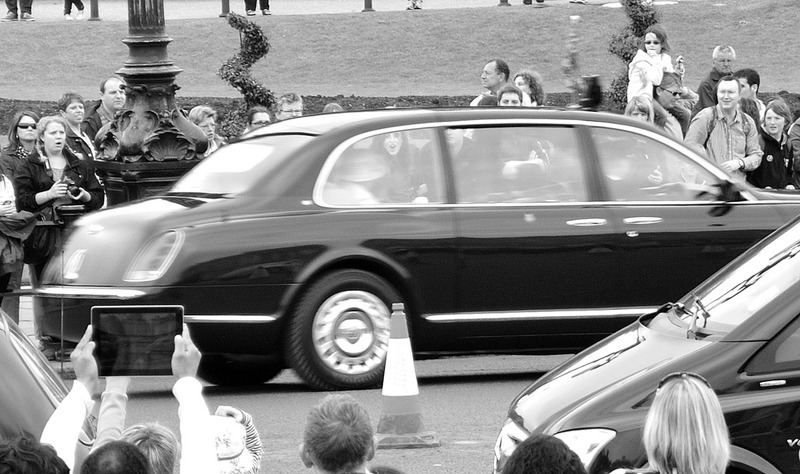 I love the face of the girl looking in the car the other side of the Queen; priceless!! Great shot.